In the mid 1800’s, while living at The Hermitage in Murrells Inlet, South Carolina during the colonel period, Alice Flagg fell in love with a lumberman and became engaged. Her mother and brother, a prominent doctor, believed the young man to be beneath their social and economic status and had forbidden the engagement. Alice secretly accepted the engagement ring from her true love and wore it on a ribbon around her neck. When her mother (or brother, depending on which version told) discovered the ring, an argument ensued. As a result, Alice was sent away to a school in Charleston, South Carolina. 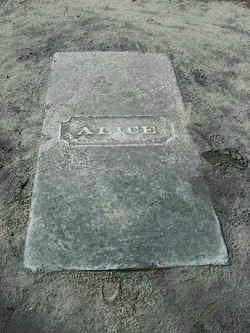 Being distraught over losing her true love, Alice became gravely ill. Her brother traveled four days to Charleston and four days back to Murrells Inlet by horse and carriage. Upon returning home to The Hermitage, Alice fell into a coma and died. According to legend, Alice Flagg’s ghost still haunts her home in The Hermitage searching for her one true love. At her gravesite, it is said that she continues to search for her lost ring. If you place your ring on her grave and then walk backwards around her grave thirteen times (the number of times also varies according to the storyteller), your ring is said to disappear. The ghost of Alice Flagg is one of the most popular ghost stories on the South Carolina coast closely followed by The Gray Man, also of Pawley’s Island. The stories do vary with each teller of the legends. My family and I decided to find out about Alice Flagg for ourselves. One year, during the Halloween season, my husband I took the kids and a couple of their friends out ghost hunting and Alice Flagg’s grave were one of the places we visited. We put a ring on the grave and walked around the grave marker thirteen times backwards (staying on the path already there made by the years and years of past walkers). Quite disappointedly, nothing happened. Woody Chavis, a local Georgetown resident, said: “My mother once told me a story about walking around the grave and Alice would turn your ring because she is looking for the one her daddy denied her. “It was not her father. It was her brother who tossed away her ring after she became secretly engaged while at school in Charleston. She had to come home due to illness and the ring was discovered which she had hidden and was wearing around her neck,” Melissa Jane Wyndham of Columbia. Whatever the story, the legend lives on more than 100 years later and every year, especially around Halloween, Alice Flagg has visitors. Everyone is trying to help her find her missing engagement ring; evident by the bare and grassless path around her gravestone (All Saints Church now locks its gates at night so no one can come in anymore. Anyone caught sneaking in is fined for trespassing).